Some visitors come to Florida’s Cocoa Beach for the weather and the waves, but for fans of NASA and the space program, its appeal is a blast from the past. 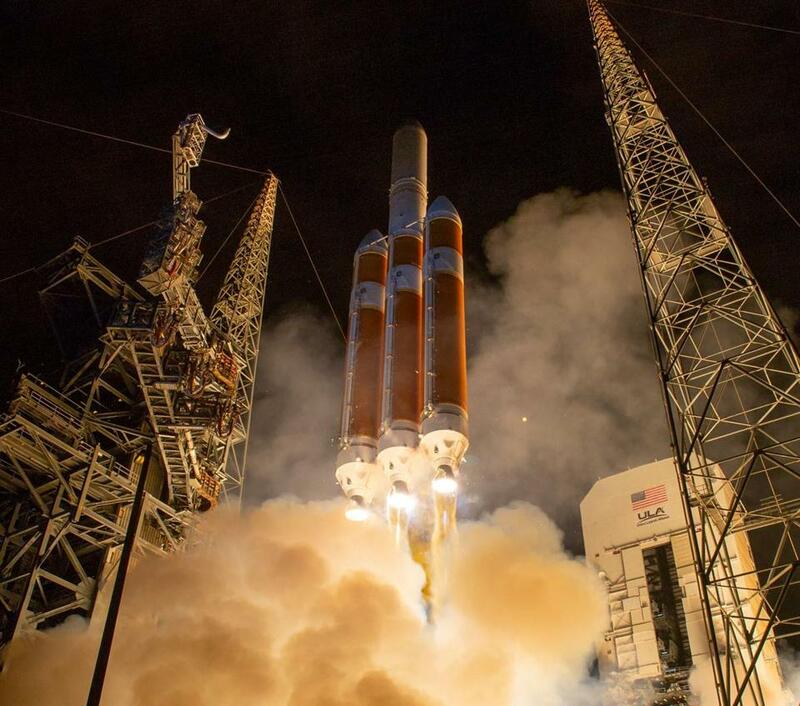 A Delta IV Heavy rocket launches from Cape Canaveral earlier this year. 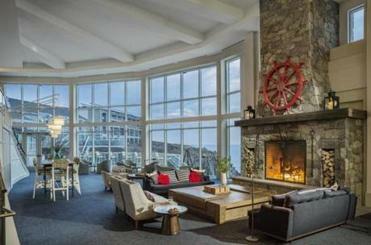 When choosing lodging, I have well-worn preferences: hotels over motels, mid-priced brands over boutiques, and if the destination is near the sea, I always angle for an oceanfront view. Cocoa Beach, Florida, has multiple properties with those qualities. But on a recent stay, I made an uncharacteristic choice: a two-story, slightly drab, sub-$100-a-night motel. Its bar was closed for repairs, and the beach is a long walk across busy Route A1A. What La Quinta Inn Cocoa Beach-Port Canaveral (321-783-2252, laquintacocoabeachportcanaveral.com) lacks in ambiance, however, it makes up for in provenance. It was built during this region’s boom in the early 1960s, when President Kennedy promised to send men to the moon and those men trained at NASA’s newly built Launch Operations Center, a few miles north at Cape Canaveral. The astronauts spent long months bunking at Cocoa Beach motels; in off-hours, they raced Corvettes (gifts from a local dealer) to blow off steam. “At night the pool areas of the motels became like the roaring fraternity lounge of Project Mercury,” Tom Wolfe recounted in The Right Stuff. Observing how much NASA was spending on motels, the astronauts decided to pool their money to invest in the newly built Cape Colony Inn — now called La Quinta Inn. Today a modest sign by the pool lists the motel’s original astronaut owners, including Alan Shepard and John Glenn. In the lobby is a mural of them in their spacesuits. A sign by the pool lists the motel’s original astronaut owners, including Alan Shepard and John Glenn. 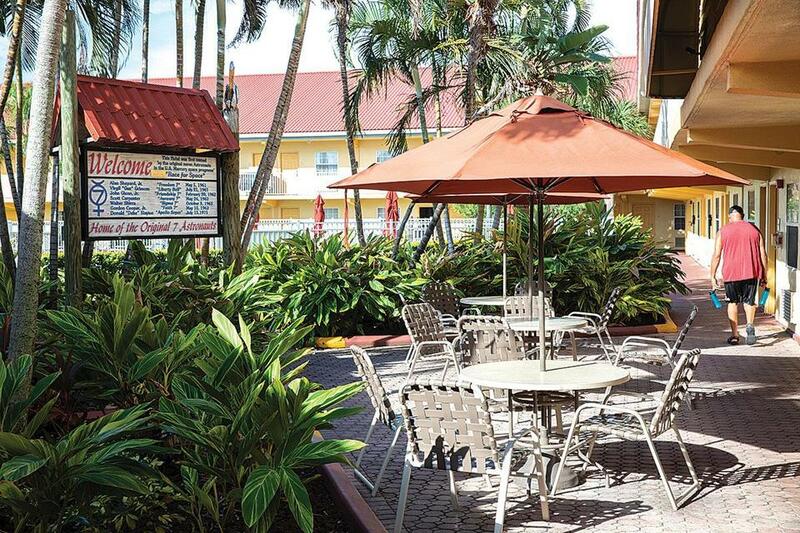 If sleeping in a motel that once housed Mercury astronauts doesn’t give you a slight thrill, Cocoa Beach may not be the right destination for you. If you aren’t enthralled by Ryan Gosling’s Oscar-worthy portrayal of Neil Armstrong in First Man, and if you aren’t already anticipating next July’s 50th anniversary of the lunar landing, you may want to keep driving. Florida has plenty of options. Clearwater’s beaches are more highly regarded. You will eat better in Naples or Miami. The night life is livelier in Key West. But Cocoa Beach’s location — about an hour’s drive from Orlando — makes it a convenient post-Disney add-on for families seeking a few inexpensive days beside the warm Atlantic. And if the family includes curious, STEM-minded children or an adult who still marvels at the audacity of the people who climb atop rockets and calmly await the call of “3 . . . 2 . . . 1,” then Cocoa Beach becomes hard to beat. The morning after my arrival, I’m 20 miles north of Cocoa Beach, flat on my back, wearing a NASA helmet, headphones, and thick gloves, wielding wrenches as I float under a life-size Erector set. This is Spacewalk Training, a 30-minute exercise that’s part of the Astronaut Training Experience (ATX) facility. ATX opened earlier this year at NASA’s Kennedy Space Center Visitor Complex (855-433-4210, kennedyspacecenter.com), which lies inland, across the Banana River from Cape Canaveral. The chair in which I’m reclining uses pressurized air to float along the floor, like a puck on an air hockey table, creating a mild microgravity sensation. Through my headset, my mission commander issues instructions — detach this, replace that, unplug those — to guide me in fixing the arm of the space station under which I float. A few yards away, a teenager wearing virtual reality goggles is taking a simulated walk on Mars. More committed visitors to the ATX can even sign up for a seven-hour experience of living on a Mars space station. The new ATX building sits at the center of the NASA visitor complex’s 42-acre facility. One large exhibit houses the space shuttle Atlantis; another, called Heroes & Legends, dives into the personal histories of astronauts. 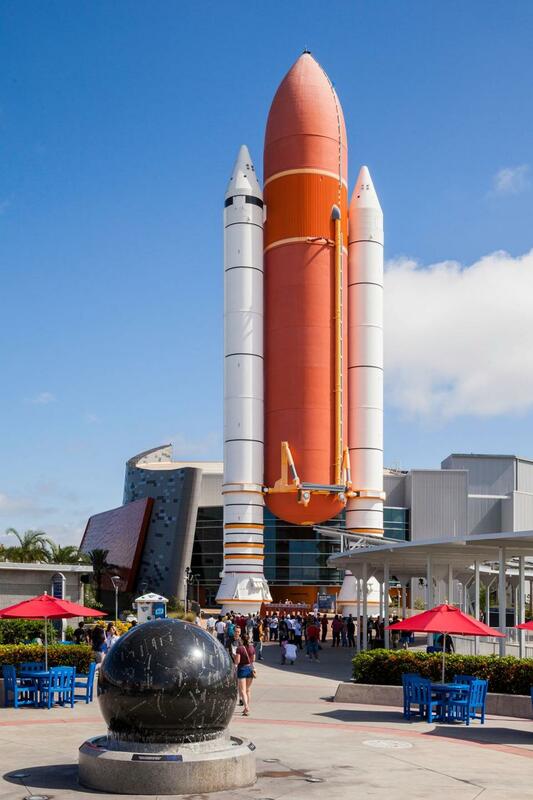 Outdoors, there’s a garden showcasing various types of rockets and crew capsules, a memorial to fallen astronauts, and a mock-up of the Orion spacecraft that’s being readied for flight in 2019. But these awe-inspiring artifacts are outnumbered by movies and interactive computer displays aimed at generations raised on video games. Other parts of the facility — especially the separate Apollo/Saturn V building, my favorite exhibit — offer a vivid retelling of the history of the space race. Visitors at the Kennedy Space Center examine exhibits and artifacts from America’s space program. Even for someone who knows a bit about NASA’s history from books and documentaries, seeing the equipment up close is revelatory. The rockets that propelled the astronauts into orbit are impossibly large, and the capsules that sat atop them are teeny tiny. (It seems unfathomable that two men spent 14 days orbiting in a Gemini capsule, whose interior looks smaller than a Mini Cooper.) Another plus: The NASA personnel who guide visitors through the exhibits could put Disney’s personable staff to shame. A quiet older gentleman answering questions about the Atlantis shuttle turns out to be a retired electrical engineer who spent 33 years designing shuttle electronics. NASA created the complex (and its pricing structure) to allow visitors to enjoy a quick once-over or take a deeper dive. I go deep, supplementing the $57 adult admission with the $30 spacewalk, a $29.99 lunch with an astronaut (a surprisingly good buffet at which approximately 200 guests ask two-time space shuttle veteran Winston Scott questions about the 24 days he spent in space), and a $25 extended bus tour of the Kennedy Space Center. The tour, led by a guide who’s clearly excited about the space program, stops to give visitors close-up views of the two primary launch pads from which the Apollo missions departed. Every few weeks, there’s a rocket launch from the site, and visitors are allowed to watch from a safe distance. The guide describes how excitement is building for the upcoming unmanned test flight of the Orion capsule, which will make a three-week trip around the moon. “Come back next year — we’ll rattle your teeth,” he says, grinning. Cocoa Beach quickly reveals its working-class roots: The tattoo shops, strip malls, bungalows, and signs blaring Nothing Over $8.99 echo the hardscrabble Jersey shore towns I recall fondly from my youth. Fresh seafood abounds in the beachside bar and grills, but there is a sameness to the menus, each seeming to offer its own version of coconut shrimp, seared tuna, smoked fish dip, and fried alligator tail. On the plus side, the prices for everything are noticeably lower than in Florida’s more upscale cities. Like La Quinta Inn, Rusty’s Seafood and Oyster Bar (321-783-2033, rustysseafood.com) has legit NASA cred: Its wall contains 1970s-era photos of Apollo astronauts holding reunions here. 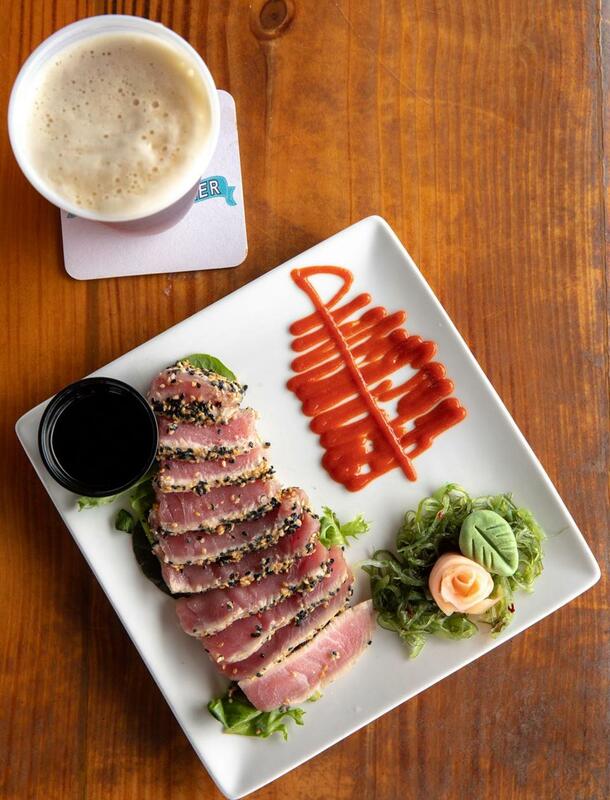 Located a few miles north of Cocoa Beach, on Port Canaveral’s waterfront, it features a large tiki deck with live music most nights; during a quiet lunch hour, its tuna poke is tasty. In downtown Cocoa Beach, Fat Kahuna’s (321-783-6858, fatkahunas.com) features a small dining room and a Hawaiian-influenced menu that’s more ambitious than a typical bar and grill’s. 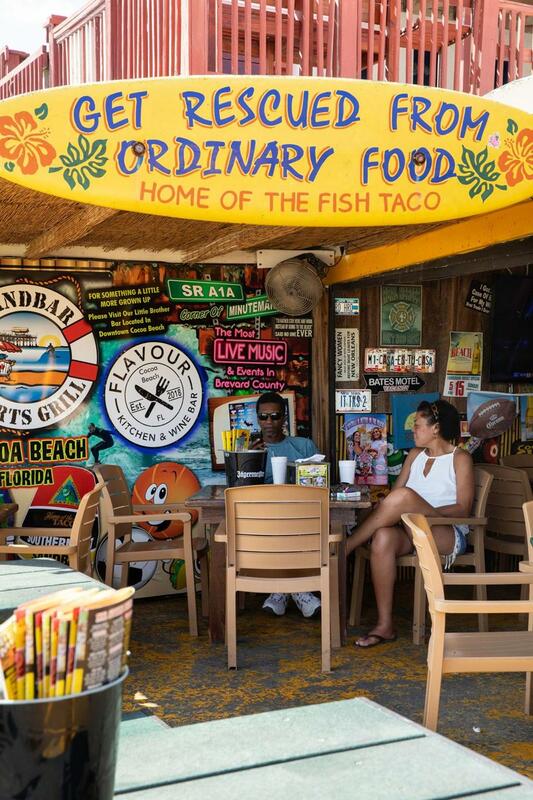 You won’t find beach bars more authentic than Sandbar Sports Grill (321-799-2577, sandbarsportsgrill.net), steps off the sand and with surfboards hanging from the ceiling. Locals rave about its fish tacos, so after a meh first meal there, I return for a second try. While the tacos don’t take me to the moon, its DJ and a long list of drink specials — including free beer until either team scores during Monday Night Football — make me suspect that on the right night, Sandbar could be the scene of epic revelry. 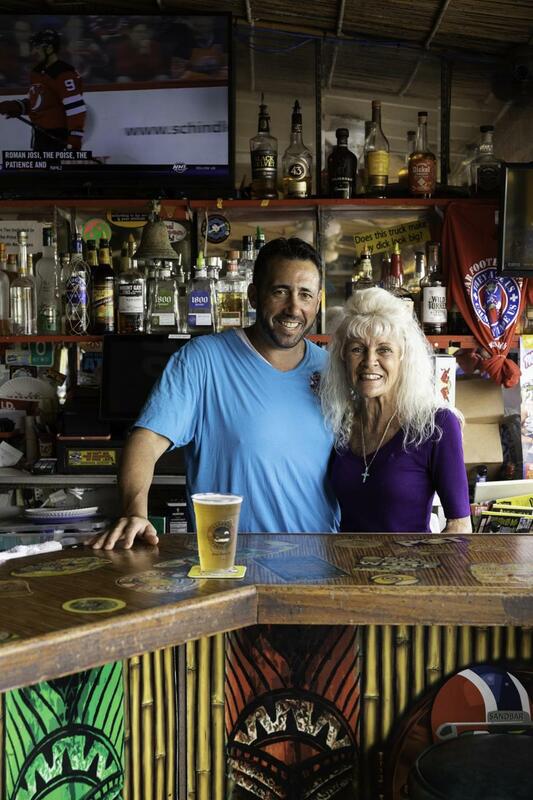 Sandbar Sports Bar co-owner Andrew Bunin with “Yo,” a popular Cocoa Beach bartender. My favorite meal takes place during happy hour at Rikki Tiki Tavern (321-783-7549, cocoabeachpier.com/dining/rikki-tiki-tavern). It’s an open-air bar under a thatched roof at the end of the 800-foot Cocoa Beach Pier, which juts into the Atlantic beside the area’s best surfing spot. Over sesame-crusted tuna and Pier beer (a local dark lager), I watch a dozen lithe surfers paddle into waves a few yards to the south, pondering a chicken-and-egg question: Do surfers look phenomenal in swimsuits because the sport provides a fantastic core workout, or do only people who look phenomenal in swimsuits take up surfing? And is surfing really as hard as it looks? The next morning, I aim to find out. Cocoa Beach advertises itself as the surf capital of the East Coast, and its Ron Jon Surf Shop claims to be the world’s largest. Armed with this knowledge, I casually mention to one shop employee that I’ve heard Cocoa Beach has the best surfing on the East Coast. He looks at me like I’m nuts. There’s far better surfing in North Carolina, he says, patiently explaining what people mean by “surf capital.” “More champion surfers grew up here than anywhere else on the East Coast,” he says, mentioning hometown hero Kelly Slater, the 11-time world champ. Paradoxically, this isn’t because the waves in Cocoa Beach are spectacular. Rather, the consistent yet moderate waves in Cocoa Beach mean young surfers must work harder and learn to do a lot with a little, so that when they encounter truly world-class surf in Hawaii or Australia, they can charge and carve. I’ve never surfed before, so I sign up for a one-hour, $65 private lesson at School of Surf (321-406-0433, schoolofsurf.org). Inside the shop, I’m greeted by Nick Hoff, a 22-year-old former Amateur Athletic Union surf champ. After a quick safety briefing, we grab a longboard and head to the beach. Hurricane Florence passed a few days ago; 3-foot swells roll in steadily. We wade into waist-deep water, and I clamber atop the board. He likes that I’ve paddleboarded and water skied a few times. “I can always tell when someone has watersports experience,” he says, suggesting I’ll find surfing easy. Despite his help, it’s still hard. While attempting to catch some waves, my feet slip. Other times, they tangle in the ankle line. Instead of popping directly to my feet, I often get stuck on my knees. On a few rides, I get to my feet momentarily before toppling in shallow water. After every ugly wipeout, Hoff cheerfully diagnoses what I did wrong and offers encouragement as I squint through the sting of salt and sun. “Do people ever wear swim goggles while surfing?” I ask Hoff. “Uh, no,” he says. Swedish tourists Moa and Kevin Simonsson prepare to take a lesson at the School of Surf. Every so often, I get lucky and find my way to a wobbly upright position. Over the course of an hour, I ride perhaps four waves all the way to the sand, hopping off the board on my own terms. Each time, Hoff looks genuinely ecstatic. “This is the easiest lesson I’ve taught,” he gushes. “You’re a natural!” (He’s lying, but I tip him well.) He assures me that if I spend two hours surfing for each of the next five days, I’ll have picked up the skill for life. “It’s like riding a bike,” he says. If I had more time in Cocoa Beach, or if I’d brought children, there would be plenty more to do: zip-line parks, charter fishing, kayak tours, and manatee-watching boat tours. If I do come back, I plan to align my schedule with a rocket launch. A couple of days on the Space Coast has fueled my interest. I’m ready to get my teeth rattled. 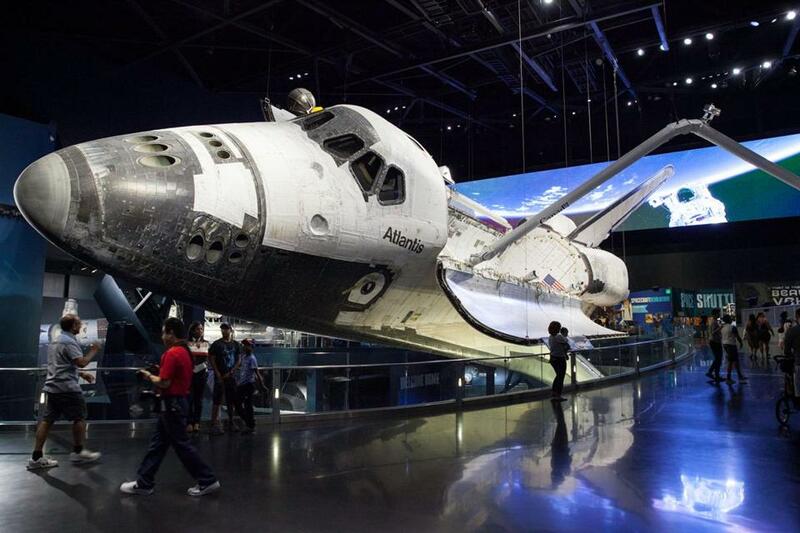 Visitors to the Kennedy Space Center can get an up-close look at the space program. The sesame-crusted tuna and a Pier beer at Rikki Tiki Tavern. A couple relaxes at Sandbar Sports Bar in Cocoa Beach. Daniel McGinn is a senior editor at Harvard Business Review. Send comments to magazine@globe.com. Get the best of the magazine’s award-winning stories and features right in your e-mail inbox every Sunday. Sign up here.